This being the second Arlington home on our favorite's list, it deserves to be recognized by local homeowners who are looking to replace the siding on their home. 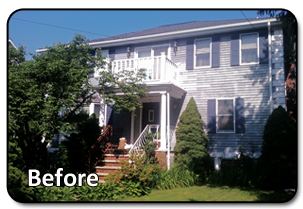 This local home in Arlington, MA had old ashy-gray cedar siding that was absolutely killing the curb appeal of the home and the homeowners had enough of it. These homeowners decided to embark on a journey to find new siding for their home and after much research, they came across Everlast Composite Siding. 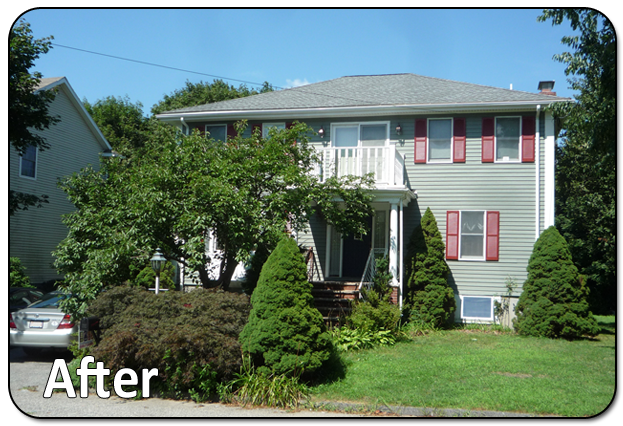 After receiving their free, no-hassle or pressured estimate, they felt more than comfortable with choosing Everlast Composite Siding for their home and were more than confident in their decision. I mean its huge investment, so why not make sure your making the right step to getting value back on your home? It made perfect sense then and makes perfect sense now and it is clear that Everlast Composite Siding is the best siding available on the market. The homeowners decided that they were going with the Spanish Moss colored 4.5 inch Everlast Composite clapboard. They honestly chose the million-dollar answer because their home looks gorgeous after the installation was complete. In order for this home to reach its final gorgeous look, we had to remove it's old wood siding, remove and reinstall the electrical meter and light fixtures. We installed Everwrap moisture barrier and fastened the siding with stainless steel ring-shanked nails. It was an absolute homerun for this home and the owners couldn't have been more happy with the brand new look of their home!